Sushi is scrumptious, easy to make, and possibly the fastest and most accessible contact point for Japanese culture that anyone could find. Plus, almost every ingredient that goes into making this tasty delicacy is filled with benefits. Clearly, sushi has a lot going for it. 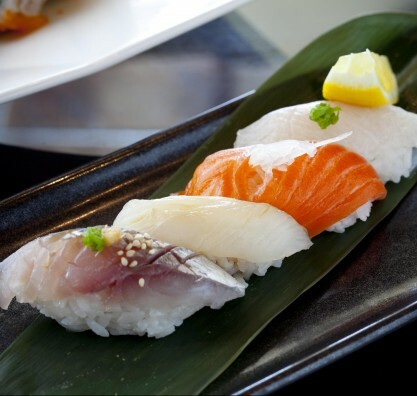 To truly savor sushi when you eat it in one of our Mikuni restaurants however, you first have to know how to eat it right. Do you know that lifting a piece of sushi with your chopsticks and dipping the base in soy sauce is the wrong way to eat it? Foodbeast contributor Elie Ayrouth teaches you how to eat sushi, as she succinctly puts it, ‘like a sensei’. We popped into Mikuni in midtown Sacramento to find out how to put nigiri away like a true boss. We chatted with head sushi chef Jesse, a great dude who didn’t scold us for rubbing our chopsticks together, and he agreed to school us on proper sushi etiquette. First, he started out by telling us what not to do. Don’t dunk on the base — the rice will soak up too much soy sauce (and ruin the flavor), causing the base to disintegrate. Don’t use chopsticks — sushi is a sensual experience and should be eaten with your hands. Don’t pile on the wasabi — this often leads to the subtle flavor of the fish being masked by the wasabi’s intense heat. Get it? Got it? Good. Now, it’s time to put what you’ve learned into practice by visiting a Mikuni sushi restaurant in your area and ordering the best-tasting sushi we have to offer. Mikuni features sushi rolls so many that it’s practically impossible to print them all in the menu. Plus, if you have a hankering for something special, we are more than willing to customize and prepare it for you.